I have a gift for you, my lovelies. I know. You’re all excited. Decaying, you say? What does that mean? 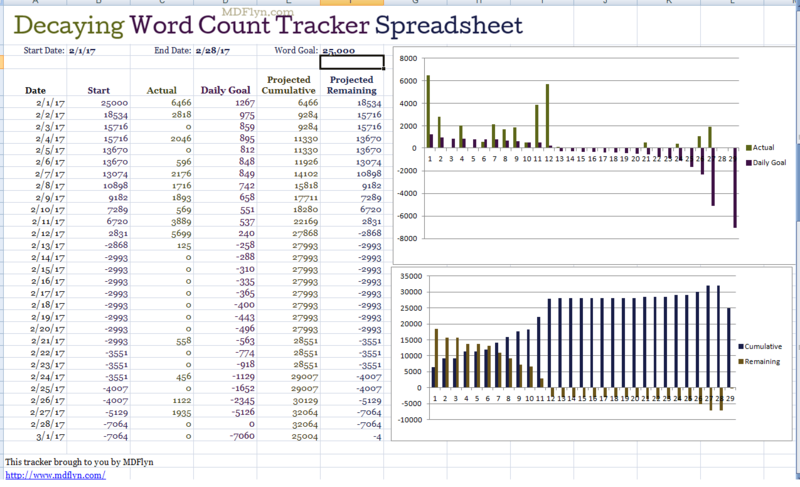 I have created a beauteous word count tracker for you. It’s a fancy mathey way to say reverse NaNoWriMo (National Novel Writing Month) using the Reward System. In the Reward System you reward yourself at the end by only having to type one word. I didn’t do that exactly, because I wanted to be able to stretch my deadline out, and math is hard. Anyways. You start with a large word count goal and each day it counts down. But nothing explodes at the end. If you’re all excited and you get a lot of words at the start, but struggle at the end, this is the word-count goal calculator for you. 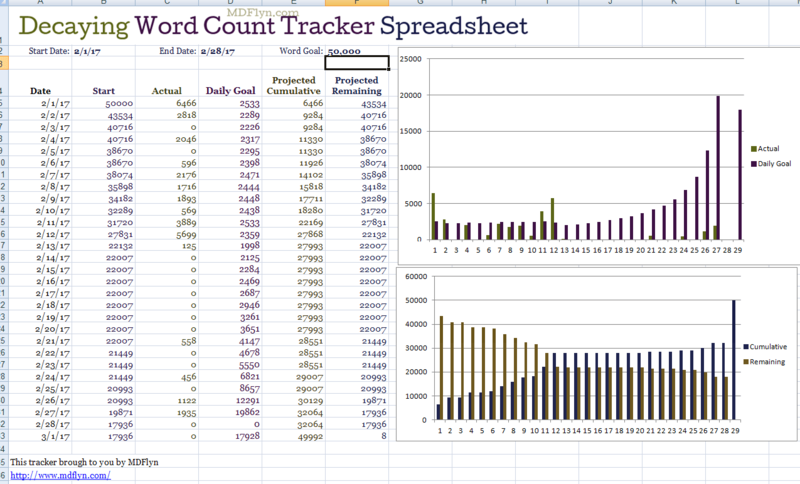 Not only does this word count tracker wind down, but this spiffy worksheet recalculates based on the words and days you have left. So say one day life happens and you get a big shiny 0. It just bumps your total down to the next day and chops it into little bits all over again. For example. I’m attempting to write 75,000 words in 28 days. Note: Feel free to write more. If it’s coming (and if you have the time) why wouldn’t you write more? It’s not a cutoff. It’s a goal. You’re a grown up. Do what you want. Also note: 75,000 words in 28 days is not realistic for me. I don’t think. Actually I usually have no problem getting 3,000 words in a 2 hour writing session. So close if I don’t skip any. Instead of torturing myself, I will make a concerted effort. I will see how it goes, and at the end I expect to have a good idea of when I can actually finish. Then I can just drag my formulas down for the additional days I need to add to my deadline. You will also see some spiffy charts on the right to help motivate you. I have to say the wordcount goal countdown is a much more encouraging method that I find very motivating. It’s almost like whack-a-mole, I have the urge to squash that bugger. The first time I tried NaNoWriMo I had something happen and I missed a couple of days. This left me with no idea how many words I needed to get, except to double up, which I did not have time for. I failed and it’s TRAGIC. Even if NaNoWriMo just doesn’t work for you, you can still set aside some concentrated time to work. If you add rows at the bottom of this spreadsheet you can extend your deadline. Copy that last row, pull it down, and paste. Voila! Two months to work. Or three. Or thirteen. Or something more realistic than one. You can use this for AnyNoWriMo or AlltheNoWriMos. I’m using this for my FebNoWriMo. Edit the start and end date, the total word count, and add your actual word counts as you go. Troubleshooting: If you break it I can’t help you, except to break it more. My husband charges an exorbitant rate. I suggest redownloading or asking Google. Thank you to hubby for doing the hard math!